How do you enter for a chance to be gifted? Simply comment on this very post. On Monday, December 3rd, 2018 sometime after 6pm Eastern, we will randomly determine those to be gifted from the comments received. It really is that simple. 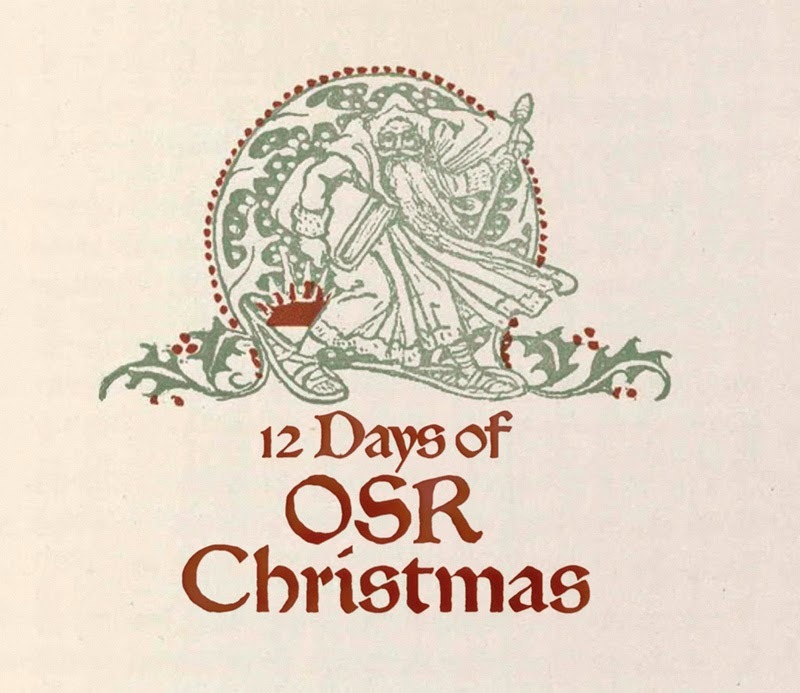 Check back often, because we'll have at least 12 days of OSR Christmas during the month of December. Note - stuff I'm shipping MAY not ship until after Christmas. I've found a hidden and forgotten post office here in Queens, so I do hope to ship before Christmas, but it may get swamped. Time will tell. Wow, you hit the ground running for sure. Awesome set of goodies. For the record, I'd love to score 1, 2 or 3. If I happen to come up for 4 or 5, please reroll and give those to someone else since I already have them both. Huzzah! Merry OSR Christmas to all! This is awesome! Wow, it's going to be a Merry OSR Christmas! That is quite the early yuletide gift pile . . .
Loads of good cheer in this bundle. Sign me up! Count me in for a chance at an OSR Christmas! WOW - so much great stuff. Woohoo! My favorite time of the OSR year is back! Merry Christmas and thanks for doing all this! This is a very generous and high quality gift! Eric - thank you so much for organizing your OSR Christmas give away every year! You (and Rach) are great examples of how to grow the community! That is some nice Christmas loot!! Thanks to the generous donors and the Tavernmeister for making the season OSR Merry! Crap,my long comment disappeared somehow. I'll just say,anything but Zweihander since I already have it,and you rock for doing this. Ok,hope third time's a charm. Anything but Zweihander since I have it already. This is a great way to start the OSR Christmas! Thanks to Erik and all of the generous vendors. Merry Christmas to all! Thank you for running this again. So grateful that you do this. All the OSR gamers liked Christmas a lot, but the Grinch, who only played Pathfinder, did not. Wow that is an awesome haul! Can I add PDF's of Beneath The Fallen Tower? This is almost as cool as that time Ernest saved Christmas! These are all fantastic! Woohoo! I've been curious about the Midderlands since you recommended it, but have never pulled the trigger. Good stuff you got for prizes, sir! Talk about hitting the ground running! Best of luck to everyone! Wow, starting off with a bang. These are some great gifts! Merry Christmas to all! And critical hits for everyone! Thank you for heading this up! A very generous start to the holiday season! (Apologies if this is a double post...it redirected me after I signed in with Google and I'm not sure whether the first post went through to me moderated). merry christmas fellow dice rollers!